Finland: Police believe campaign posters for Finnish People First Party incite against an ethnic group……. – The Tundra Tabloids……. If you don’t like someone saying, “Migrants out!” or “Homosexuals back into the closet”, confront them, and their supporters in a rational and reasoned way. Meet speech that you’re in disagreement of, with more speech. State the case, win the argument. 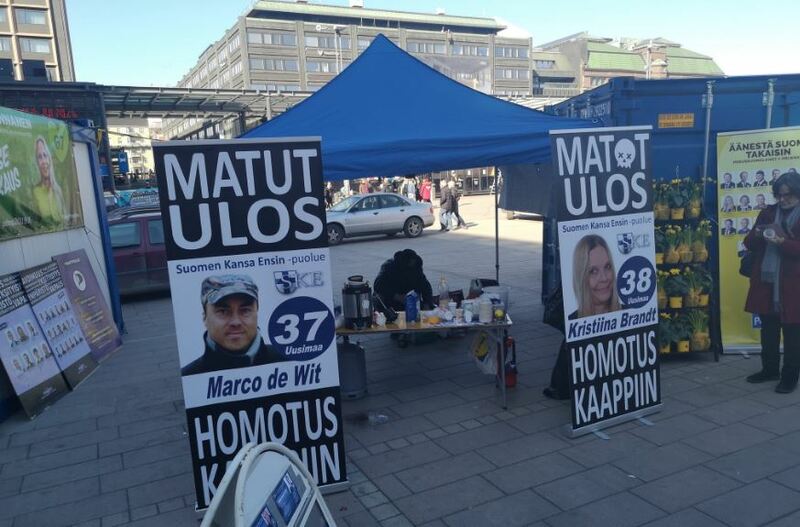 This campaign took place at the weekend in Narinkkatori (square) in Kamppi. Helsinki Police suspects a crime involving the Finnish People’s First Party party in the spring elections in Narinkkatori in Kamppi, Finland. Among other things, the electoral campaign has featured election ads, the texts of which are suspected to be the hallmark of the crime. According to the police, campaigning has been hateful and aimed at discrimination against immigrants and sexual minorities. The police have launched a preliminary investigation into the matter. At this point, the criminal title is an investigation into incitement against a group of people. Two candidates for parliamentary elections are suspected of a crime. Another suspect is the party chairman Marco de Wit. In addition, another candidate for the party is suspected. Previous Post Previous Post US: Sharia-supremacist Ilhan Omar falsely accuses Jewish Trump advisor of being a “white nationalist”……. Next Post Next Post ZOA President Mort Klein addresses Islamic Jew-hatred before congressional committee…….